We have a feeling most initiates are going to walk away from their first viewings of "Divergent" this weekend pretty satisfied with how faithful the adaptation is. After all, director Neil Burger's version does hit the most essential marks (and, more importantly, brings out the feels) of Veronica Roth's beloved bestseller. Even so, as with just about any book-to-screener, the movie did take its fair share of creative liberties with the story, and Roth's legions of oh-so-Erudite fans are bound to notice a lot of 'em — even if some of them are a bit nitpicky. Here, we parse out the biggest changes we noticed in the jump from the page to the silver screen. Did you catch 'em all? Change: In the book, the character Four is just 18 and has risen to prominence within the Dauntless faction in the two short years since his own initiation. Since the actor chosen for the role (Theo James) was 28 during shooting, however, the filmmakers opted to split the difference and peg him as being around 24. Result: This little shift might make the relationship between Four and teenager Tris (Shailene Woodley) seem a bit icky to some. That aside, the age increase does lend credence to his faction status. As Theo James himself framed the issue, "for him to have that experience as a leader and as someone of high skill that as he is ... I think it makes more sense that he's been there a bit longer." Change: There is a blink-and-you'd-miss-it moment of a Maybe Uriah But Not Uriah lookalike popping in during the zip-lining scene, and his name was listed on the Dauntless initiates board, but otherwise the film gave Tris's other pal (and the other Dauntless-born initiates, for that matter) the ax. Result: This is a bummer for anyone who particularly favors the character, but him being trimmed didn't change too terribly much about the plot — except that Tris spends most of her time with fellow transfers. Also, there's a silver lining in store for the Uriah faithful: He'll make it into the sequel(s). In fact, producers explained away the deletion as a means to ensure "a great actor" can be chosen for the part. Change: On paper, Peter — at least in book one — was almost exclusively violent and unlikable, but actor Miles Teller brought a slightly humored approach to the film character. That's not to say he wasn't still a cruel jerk, but the lack of eye-stabbage and towel-yanking and such did tone down the terror a bit. Result: A lot of people are coming away from the movie having actually enjoyed Peter, finding him more well-rounded and sometimes even witty — which is exactly what Miles Teller said he wanted to happen. Having the character be semi-redeemable in the film could ultimately prove beneficial to "Insurgent," since he's supposed to be much less horrible in the sequel. Change: Readers will definitely notice more Jeanine Matthews in the cinematic iteration of "Divergent." From the Choosing Ceremony to that ending (more on that below), the character is involved in several more scenes than she was in the literary origin. Result: More Kate Winslet screen time. Nothing to complain about with that, right? Not when she's awesome. Change: Members of Abnegation are teasingly dubbed "stiffs" in the book partly because they aren't physically affectionate with one another, even within families. In the film, though, Tris' parents (Tony Goldwyn and Ashley Judd) hold hands with one another and — gasp! — even dare to hug their kids. Result: This is an improvement, really, because it helps strengthen the observable bond of the Prior family early on and make later events more emotionally impactful. Change: The film presents just a few of Tris' fear landscape elements, and one of the ones that does make it in gets an unfortunately disturbing take. As in the novel, Tris is scared of getting intimate with Four, but somehow it plays out onscreen as a borderline assault with Tris imagining that Four is basically trying to force himself upon her. Result: Many fans have been simply creeped out by the moment and see it as a poor (and just weird) representation of the book's scene. Change: A good chunk of the brutality in "Divergent" was trimmed down for its silver screen iteration. There are less (and shorter) fight sequences, for example, and no one dies jumping off the train or gets stabbed in the eye during initiation. Oh, and the shooting of Tris' parents is not directly shown on-screen either. Result: The film was rated PG-13, which is ideal for the intended demographic. Meanwhile, the gravity of danger involved in joining Dauntless is arguably still apparent enough. 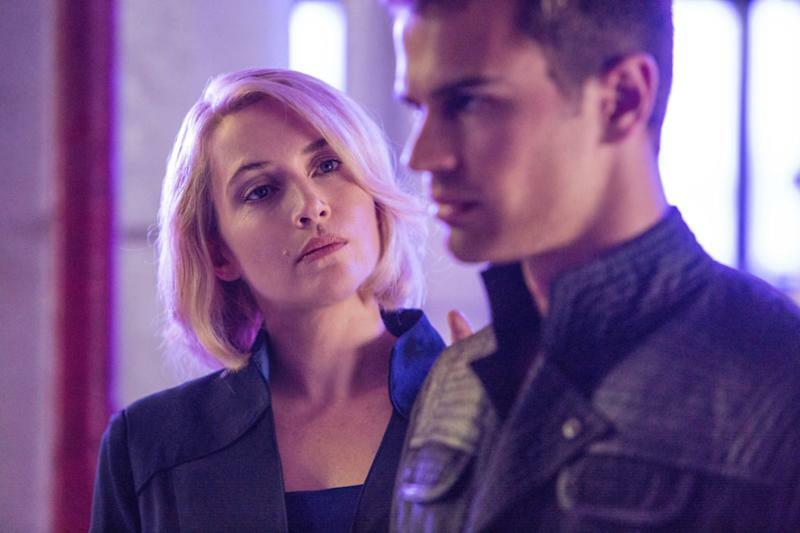 Change: There were a couple of reader-favored moments with Tris and Four which did not make the film cut. Like the flirty scenes with "Drunk Four" and his quips about her calling him a "boyfriend" — not to mention their steamy cuddle session in the shrinking room of his fear landscape and that ooh la la-worthy train ride over to Erudite HQ. Result: Some of the slow burn romantic tension existent between the characters on paper didn't quite translate to the screen. The pic still presents them as a romantic item for sure, but the book version of Four was way more of a sweet talker than his cinematic counterpart. Change: The movie makes two major additions to the story's ending: (1) Tris declares to Jeanine directly that she's Divergent, not Dauntless, and (2) then uses the serum against her, forcing her to shut down the mind control program rather than doing it with Four as in the book. Result: Once again, this basically just gives Kate Winslet more to work with in "Divergent." Über observant "Divergent" fans might also have picked up some of these more nuanced changes. Maybe they didn't have quite as big an effect as the others above, but they were still probably noticeable to a keen fan eye! Whereas in the book Tris has only seen herself in the mirror on an annual basis, she steals a glance at her reflection in a spoon at dinner with her family. Instead of all black costumes, the Dauntless also wear red, and their HQ pit is made of white/light grey marble as opposed to dark stone. Tris' simulation is a bit shorter in the film, leaving out the portion with a man on the bus with his newspaper and substituting the option of cheese for raw meat to deal with the dog. Rather than solely telling Tris her results were inconclusive and to keep it to herself, Tori does fill Tris in with a few details on what it means to be Divergent. During her "First Jumper" moment, movie Tris keeps on more of her Abnegation garb. The Ferris Wheel scene is slightly shortened for the film, omitting the part where Tris slips and Four has to turn the ride on to help her. While Christina stole Tris' Capture the Flag glory in the book, Tris claims the win for herself in the movie. The game's different, too, with darts instead of paintball guns. The romantic connection between Will and Christina is hinted at but not as explored as in the text. Al's unrequited affection for Tris goes unmentioned, making his eventual death seem less significant to some viewers. The training stages are shortened from three to just two for the pic (physical and mental, nixing the emotional) and the series of initiation score reveals was skipped over. Tris' fear landscape does not include the faceless kidnappers. The initiates never go through Lauren's fear landscape with the spiders and bleeding and whatnot. Family visitation day is removed from the story, so Tris' mom instead pops up to speak with her as she's loading supplies into a truck at the Dauntless compound. Natalie still rescues Tris from Jeanine, but not in the same way — instead of springing her from a glass tank filling with water, she saves her from being shot in a field. Tris didn't get her shoulder tattoos of the Dauntless and Abnegation faction symbols.